Due equally to its ethno-linguistic diversity and the numerous armed conflicts and wars that have taken place on its soil in recent years, global interest in the Caucasus as a region has been on the increase in the post-Soviet era. As a result, especially in Western Europe and the US, Caucasian Studies has been gradually developing into a multi-disciplinary area of study, bringinging together research into the histories, cultures and politics of the peoples and states of the region. Despite being historically one of the most numerous and politically significant peoples of the Caucasus, Circassians have been somewhat overlooked by recent academic interest in the region due to their political marginalisation caused by the devastating impact of the prolonged wars, ethnic cleansings, and the resultant exile of the Russo-Caucasian War in the19th Century. It is only of late that various Circassian communities, both in the Caucasus and in the diaspora, have begun to show signs that Circassians are slowly overcoming the psychological and political effects of their calamitous past and working towards taking their rightful place in Caucasian Studies. 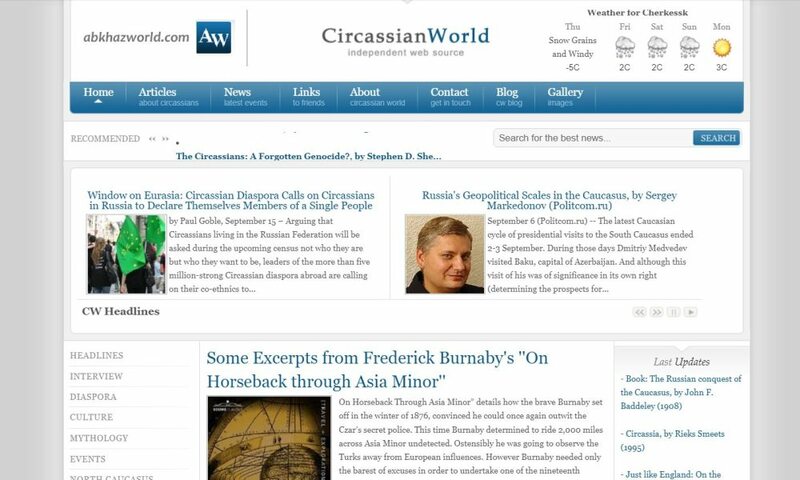 In this regard the CircassianWorld web site was created to help reduce this deficit in Caucasian Studies by gathering, compiling and publishing academic and journalistic works on the Circassians. 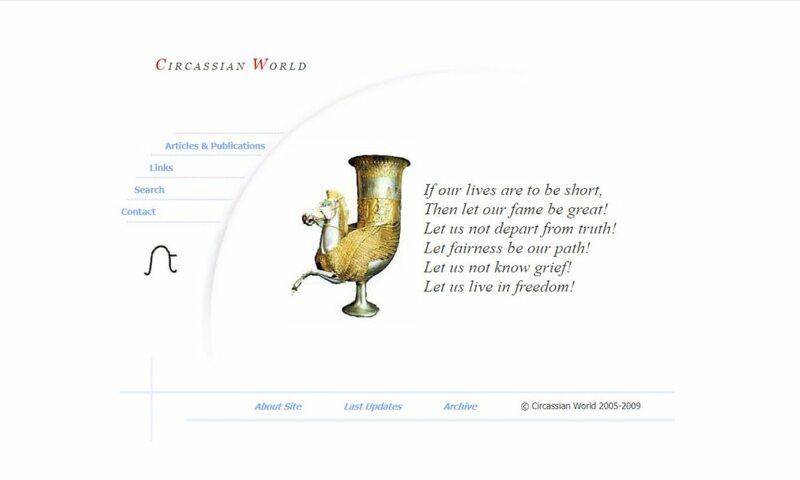 The "Circassian World" website was created in February 2005. The website was down between 2013 - 2017.
to be a forum for Circassian to voice their opinions and to make their desires known to an international readership concerned with the maintenance of human- and minority-rights in the Caucasus. It goes without saying that we continue to welcome feedback from all visitors to this website with regard to all our endeavours. Special thanks to Dumanish Auledin (KBR, Nalchik), the late Amjad Jaimoukha (Jordan), John Colarusso (Canada), George Hewitt (UK), Stephen D. Shenfield (USA), Liz Fuller (UK), Muhittin Ünal (Turkey), Yalçın Karadaş (Turkey), Ahmet Sayar (UK), Şamil Ercan, Ömer Marşan (Bulgaria), Zeynel Abidin Besleney (UK), Murat Papşu (Turkey), Jade Cemre Erciyes (ABKHAZIA/TURKEY), Erkan Köşlük (Turkey), Sufian Zhemukho (KBR/USA), KAFDAV- Kayseri Circassian Association, Kafkasyalı Yazarlar Birliği. The Narts were courageous, energetic, bold, and good-hearted. Thus they lived until God sent down a small swallow. "Do you want to be few and live a short life but have great fame and have your courage be an example for others forevermore?" asked the swallow. "Or perhaps you would prefer that there be many of you, that your numbers will be great, that you will have whatever you wish to eat and drink, and that you will all live long lives but without ever knowing battle or glory?" Then without calling a council, but with a reply as quick as thought itself, the Narts said, "We do not want to be like cattle. We do not want to reproduce in great numbers. We want to live with human dignity. Let us live in freedom!